LEITNER ropeways has undertaken five projects in Scandinavia for the 2018 – 2019 winter season, including four new chairlifts and a surface lift. 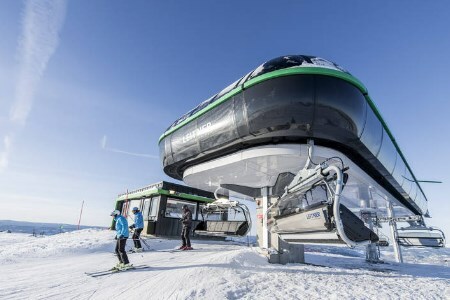 The company has completed a new 8-seater chairlift at Hundfjället, part of the Swedish region of Sälen with its four ski resorts. There is currently particularly heavy investment in infrastructure around Hundfjället and the bordering Norwegian resort of Trysil; a new airport is under construction here, which is intended to improve access to the region for winter sports tourists. The Hundfjället chairlift, named West Express, replaces a surface lift and carries guests directly to the summit of Långbackarna, where the entrance to many ski slopes of varying levels of difficulty is located. The system features weather protection bubbles, seat heating, and a LEITNER DirectDrive. “We are happy to have the chance to work together with LEITNER ropeways for the first time on project as big as the Hundfjället West Express. I am convinced that this debut will not be a one-off experience, but rather the beginning of further detachable facilities in the Sälen ski resort. Thanks to good cooperation we have succeeded in adapting our company’s experiences at other ski resorts to create a perfectly adapted new chairlift to suit the conditions in Sälen. This is reflected in the guests’ high level of satisfaction with the new ropeway”, says Ski Area Manager Per Granås. LEITNER has constructed three more 6-seater chairlifts at resorts in Norway and Sweden. Three hours north of Stockholm the new CD6 Stollift B will replace the existing two-seater chairlift in the family ski resort of Järvsöbacken. As this area also attracts mountain bikers in the summer, the chairs have been fitted with bike holders. Special lighting ensures that the first detachable system in the ski resort is visible from afar at night and can also become a prominent landmark in the surrounding area. In addition to this project, LEITNER ropeways built a 6-seater chairlift, Götes Express, in the ski resort Romme Alpin in the Swedish municipality of Borlänge. Transport capacity will also be increased by a new surface lift in the small family ski resort of Stöten i Sälen, near the Norwegian border, where LEITNER ropeways has already constructed an identical facility. The new lift will operate in parallel. At the Norwegian resort of Øyer, a 6-seater chairlift, Hafjelltoppen, was inaugurated in time for the current season. It replaces a surface lift and runs from the entrance area of the ski resort to the highest point, Hafjelltoppen.